Naagin Season 2 29th October 2016: Shivangi was helped by Sesha. She then asked her as who she was and why she was helping her. Sesha told her that she was her mother’s sister. She told her that her mother snatched her love and then she was snatching her new love. She said that she would kill her and would not let her do that. She was about to kill her, but Yamini came there and ordered he rot to stop. Shivangi reminded that she kept someone in her place. Shivanya wore the bridal dress and became Shivangi. Rocky got conscious and looked for Shivangi and his family and was shocked to see the guest dead. Yamini thought that only Sesha could get them to nagmani. She ordered Sesha to go and get Shivanya’s dead body. Sesha went and brought the corpse. Rocky came there calling for Shivanya. Yamini acted that dacoits came there and killed everyone. He ran behind Shivangi to save her but could not. Rocky cried a lot. 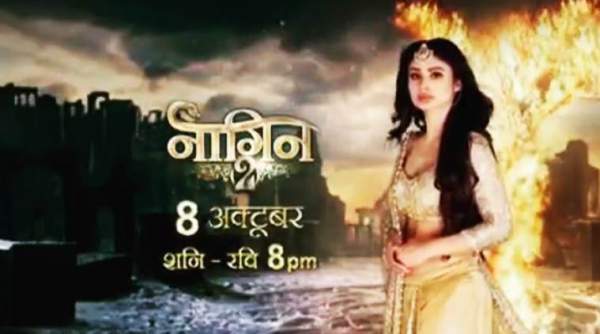 Check: Naagin 23rd October 2016. Shivangi woke up and found herself in the temple. She called out maa. But Sadhu said that Shivanya was dead. She was about to run and said that her mom could not die, but Sadhu stopped her and stated that it was a danger for her outside. She ran in the jungle. Rocky heard her voice but Yamini told him that Shivangi was dead and also showed him the dead body. Sesha saw rocky crying, and she too cried seeing her love in pain. She came to him and consoled him. Sadhu told Shivangi that her mom was not a human and was a Naagin. He asked her to see her mom’s murderer. She saw them. Sadhu then told her that her parents that they were protecting nagmani for so many years. He then told her that story of Shivanya and Sesha and said that they both used to protect nagmani. He continued to say her about her mother’s sacrifice. Shivangi walked on the street on crying and reminded rocky betraying her. Rocky too was crying seeing remembering Shivangi as he thought that she was dead. Shivangi too that if her mom was a Naagin then why she hid the truth from her and why even her mama ji did not tell her. She went to her room and read about the nagins. She then cried thinking that she had nobody with her and prayed to God to give her courage and she had to take revenge for her mom’s death. She fell from a cliff and went in the jungle. She was about to be injured from a tiger. Shivangi thought that she was protected by a snake when the tiger was about to kill her. Snake left in front of her, and she sat in shock. Stay tuned for latest Naagin news and updates.